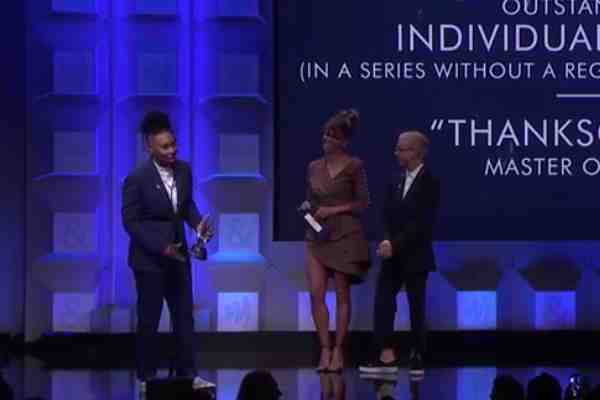 In accepting an award on Thursday, out writer-actor Lena Waithe called for unity in the LGBT community. At the 29th annual GLAAD Media Awards in Los Angeles, Waithe won in the Outstanding Individual Episode category for Master of None. Waithe wrote the episode, titled Thanksgiving, with Aziz Ansari, the show's star. In the episode, Waithe's character is seen growing into her sexuality over the course of twenty Thanksgiving celebrations. "A lot of people ask me why I say I’m queer. I say that because I think it’s a big umbrella. I don’t want to separate myself from my trans family, my nonbinary, bisexual [family]," Waithe said in accepting her award. "I feel like sometimes we can be a little segregated, you know what I mean? We need to be united. Laverne Cox’s struggle may look different than mine, but the pain we feel is the same." "We’re already othered, so why should we other ourselves anymore than we already are? We have to educate each other on our own individual journeys, because at the end of the day, we’re all we’ve got. So let’s hold on to that, and let’s hold on to each other. We’ve got to be one big family." “When we stand together, there’s no weapon they can form that can harm us," she added. Halle Berry presented the award to Waithe.